Hylactes tarnii King, 1831, Chiloé Island, and Port Otway, Gulf of Penas, Chile. English: Huet huet; French: Tourco huet-huet; German: Schwarzkehl-Huethuet; Spanish: Huet-huet del Sur. 9 in (23 cm); 5.3-6.3 oz (150-180 g). Crown, forehead, and breast dark chestnut. The rest of body is black. Southern Chile from Río Bío Bío to Brunswick Peninsula, and adjacent Argentina from Neuquén to northwestern Santa Cruz. Walks slowly. Flips debris with bill and sometimes scrapes the ground with one foot. Feeds on invertebrates and berries. 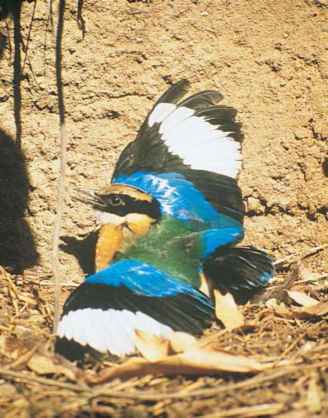 Nest placed in excavated tunnel or a hollow trunk. Two or three eggs.